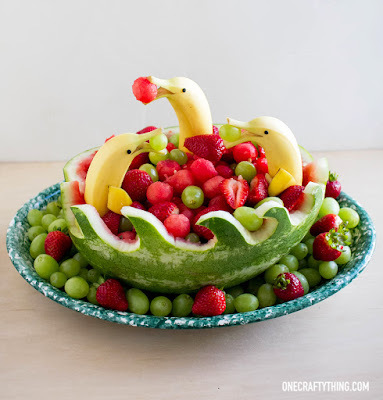 If you are looking for a really adorable and unique way to serve fruit for your summer party, look no further! This Dolphins and Waves Fruit Bowl by One Crafty Thing is fabulous. The delightful fruit presentation is quite impressive, yet easy to to assemble. Perfect for a pool party, a luncheon buffet table, or just for fun. Kids of all ages are sure to love it! Grab your favorite summer fruit and start creating a beautiful summer fruit bowl design and presentation. This is a great way to get kids to eat fruit! Start by making watermelon balls and setting them aside while you carve the rind with an ocean wave design to create the summer fruit bowl. Then fill the ocean wave fruit bowl with a mix of watermelon and cantaloupe balls, strawberries, seedless grapes, etc. As you can see in the photo above, the combination of fruit is visually appealing and quite temping to eat. Make the dolphins by simply slitting the stem of the banana and placing a melon ball in his mouth. You can dot the eyes on the banana dolphin with a black marker. 3 banana dolphins are shown in the bowl above and they look like very playful dolphins swimming in a bowl of fruit. I like to set fancy toothpicks close to my fruit bowls so guests can spear their individual fruit pieces. That also helps to prevent fingers grabbing out pieces or spoons slicing through your perfectly rounded fruit balls. You will want to serve it on a large plate or platter with slightly curved sides and place fruit pieces around the base of the wave melon to stabilize the fruit centerpiece. Be sure to look closely at the image for illustration. Thank you to Pat Austin aka Wednesday Elf for Sharing this article with me!